When you want to get lean, the goal isn’t simply to lose weight — it’s to lose body fat and not muscle. When that’s the goal, how you eat and train are hugely important. As you probably know, you must maintain a moderate calorie deficit, eat enough protein, use resistance training to preserve muscle, and limit your cardio. Proper supplementation can play an important role too. The right supplements can help you lose fat — and “stubborn” belly fat in particular — faster and prevent the muscle loss and training “slump” normally associated with dieting. And that’s why we created the Fat Loss Stack. This stack contains three supplements that accelerate muscle growth, increase strength, boost workout performance, reduce muscle soreness, and improve recovery..
Buy this stack now and get ready to safely and healthily melt fat off your body without sacrificing your muscle or the quality and effectiveness of your workouts. PHOENIX’s caffeine-free formulation helps you lose fat faster in three different ways: it dramatically increases metabolic speed, it amplifies the power of fat-burning chemicals produced by your body, and it reduces appetite. If you know what you’re doing with your diet (if you know how to maintain a proper calorie deficit), and if you take PHOENIX every day, you can expect lose, on average, an additional 0.5 pounds of fat per week. FORGE is a fat burner made specifically for use with fasted training. If you’ve ever looked for advice on how to lose fat faster--and especially “stubborn” hip, belly, and thigh fat--you’ve probably read about exercising on an empty stomach, or, more accurately phrased, exercising in a “fasted” state. Research shows that fasted training offers several unique fat loss benefits, including an increase in both lipolysis and fat oxidation rates and improved blood flow to the notoriously stubborn” abdominal region. It contains three ingredients proven to help you lose fat--and “stubborn” fat in particular--faster, preserve muscle, and maintain training intensity and mental sharpness. 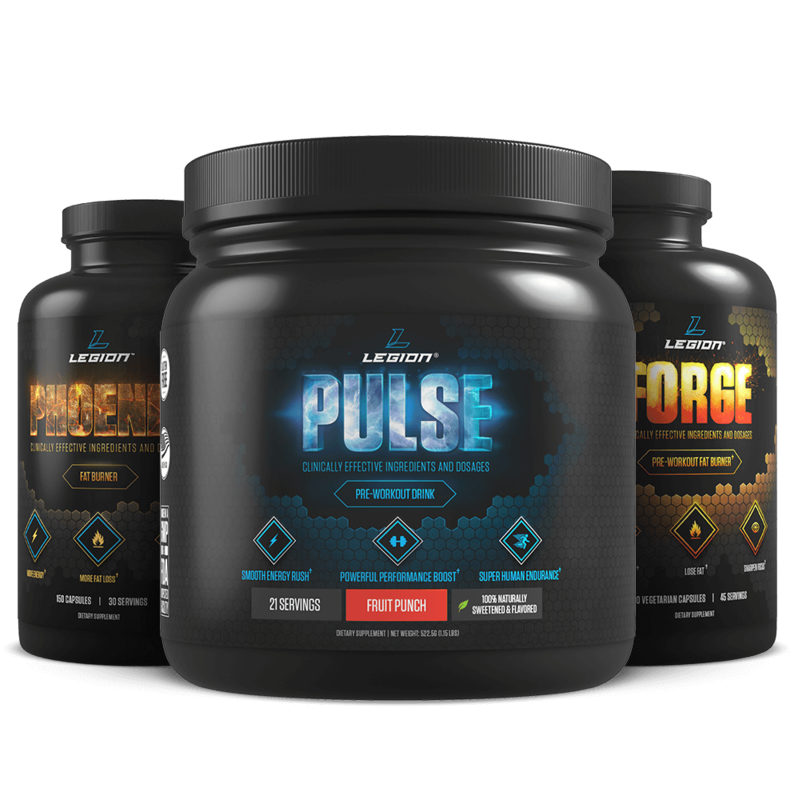 If you want a pre-workout supplement that not only gives you a smooth energy rush, but actually improves your performance both in the weight room and on the field, then you want to try PULSE. It contains clinically effective dosages of 6 natural ingredients that are scientifically proven to enhance energy levels and mood, increase focus, and improve physical performance. The research is crystal clear: PULSE will help you train harder and longer. Each of our supplements come with directions, of course, but there are several additional things you should know to get the most out of this stack. Start with one serving of PHOENIX per day to assess your body’s tolerance. If there are no non-optimum side effects (which there shouldn’t be), you can take up to two servings per day, separated by at least a few hours. If you combine PHOENIX with caffeine, it will help you lose fat faster by further elevating your basal metabolic rate (several of the ingredients in PHOENIX work synergistically with caffeine). Some people will find that taking PHOENIX on an empty stomach (before fasted training) makes them nauseous. This is a normal reaction to the green tea extract. Many of these people continue to use PHOENIX before fasted training and after a week or so, no longer experience this problem. Some do, though, and the solution is simple: take it with food. Taking PHOENIX with food can also help you feel fuller because it contains 5-HTP, which has been shown to increase fullness when taken with a meal. For optimal results, take PHOENIX every day, whether you exercise or not. Start with ½ of a serving of FORGE per day to assess your body’s tolerance. Based on customer feedback, most people notice no negative side effects but some do get slightly nauseous (this is a normal reaction to yohimbine). If this happens to you, you’ll likely find it goes away after the first week of use. If there are no non-optimum side effects with ½ of a serving per day, move up to one full serving per day. If this too is well tolerated, you can take up to two servings per day if you do two separate workouts (separated by at least a few hours). If you combine FORGE with caffeine, its fat loss benefits are magnified. FORGE is best taken before exercise (cardio or resistance training). While it theoretically will help with fat loss regardless of whether you’re exercising or not, it’s much more effective when combined with exercise. Although most people use a full serving before all workouts, some like to use ½ of a serving before lighter workouts and a full serving before harder ones. If you’re working out in a fasted state, take PULSE 15 minutes before training. You don’t have to cycle PULSE but if you want to maintain optimum caffeine sensitivity, limit your intake to no more than 400 milligrams per day and dramatically reduce your intake to as low as possible (nil, ideally) 1 to 2 days per week. The more days you take PULSE per week, the more likely you are to reap the muscle-related benefits of beta-alanine (due to the accumulation of carnosine in your muscles). OVER 150,000 CUSTOMERS SERVED AND 1 MILLION BOTTLES SOLD! so we can show you some love!